Chris Joseph's parents must have giggled like Tigger when they named their son Robin Christopher. Well the Winnie the Pooh references end right about there. He went by Chris and soon became the talk of the hockey world. Joseph was a big, mobile defenseman out of Burnaby, BC who went on to star with the Seattle Thunderbirds of the WHL. Scouts drooled over him. He was drafted 5th overall by the Penguins in the 1987 NHL Entry Draft. He made his NHL debut for the Penguins during the 1987–88 NHL season but was quickly traded to the Edmonton Oilers in the same season. The deal saw Joseph, Dave Hannan, Moe Mantha and Craig Simpson move to the Oilers with Paul Coffey, Dave Hunter and Wayne Van Dorp moving to Pittsburgh. Hey, if you have a chance to land Paul Coffey in his prime, you do it even if it costs you a blue chip prospect like Joseph. Unfortunately there were a lot of high expectations placed on Joseph after that trade. He never met those expectations. That was unfortunate, as the expectations were unrealistic. Joseph might have been replacing Paul Coffey in the minds of many, but Paul Coffey he was not. After seven seasons as an Oiler, he was traded to the Tampa Bay Lightning, and then soon began a second spell at Pittsburgh. Joseph's vagabond days were really setting in by then. After two seasons though he was claimed off waivers by Vancouver. He then signed with Philadelphia for two seasons before returning to Vancouver. He also played briefly with the Phoenix Coyotes and Atlanta Thrashers. In total, Joseph played 510 regular season games, scoring 39 goals with 112 assists for 151 points and collecting 567 penalty minutes. Joseph also played 31 playoff games, scoring 3 goals with 4 assists for 7 points, collecting 24 penalty minutes. In 2001, he moved to Europe to play in Finland's SM-liiga for TPS, before spending 3 seasons in Germany for the Mannheim Eagles. He also played in Italy for HC Milano before retiring. Since retiring Joseph became a City of Edmonton Fire Fighter in early 2007. He also remains active in hockey with his own hockey school. When Lowell MacDonald finally caught on in the NHL, you couldn't help but feel good for him. His story was one ups and downs. Everyone cheered for him when formed an excellent line with Syl Apps Jr. and Jean Pronovost with the Penguins in the 1970s. MacDonald, a good scorer but the most complete two way player of the three, had bounced around a lot in his career. The New Glasgow, Nova Scotia resident was Memorial Cup scoring hero in Hamilton while being groomed in the Red Wings system. He later broke into the big leagues with Detroit in the 1960s. For three seasons he was a bit of a yo-yo, up and down between Detroit and the farm team ironically located in Pittsburgh. These were still the days of the Original Six when NHL jobs were hard to get. He soon found himself as part of a blockbuster trade with Toronto. The Maple Leafs got him, Marcel Pronovost, Eddie Joyal, Larry Jeffrey and Aut Erickson for Andy Bathgate, Billy Harris and Gary Jarrett on May 20th 1965. While the Leafs would win another Stanley Cup in 1967, MacDonald spent a couple more seasons with Tulsa in the minors, his days in the NHL seemingly fading away fast. NHL expansion in 1967 rekindled MacDonald's NHL dream. He was picked up by the Los Angeles Kings and scored 21 goals for them in their inaugural season. But in season two his numbers slipped a bit, and the Kings even had the gall to send him back to the minor leagues, even if it was for only 9 games. Still the move irked MacDonald, who openly talked about his love of hockey but his dislike of the business. "I've been booted around a bit more than is right. It's not satisfying when you are being traded from team to team, sent all around two countries. You begin to feel unsettled. And it is a difficult life for a family. I'm a family sort of guy. I want to be with my wife. I want to see my kids grow up and I want to be there to help them when I'm needed. I don't want to keep moving them around and I also don't want them to sit in one place when I'm traded so I'll be apart from them." MacDonald, who was known as a studious and literate fellow interested in pursuing post-secondary education, went on to talk about how expansion saved his hockey career. "Expansion came just in time for me. It was overdue, really. Limiting a major league to six teams and around 120 or so players was unrealistic. Expansion opened up a reasonable number of jobs at the top for players capable of playing at the top. I was on the verge of retiring. And if I can't make it in the majors, I will retire. You simply can't make a satisfactory living in the minors. I have other interests beside hockey. There are other things I can do." MacDonald would make it in the big leagues, but first he faced a huge test of his love of the game. From 1970 through 1972 he played just 24 games in 3 seasons - 10 in the NHL and 14 in the minors - thanks to a horrific knee injury. He had six operations before the knee was finally fixed. Somehow MacDonald persevered through that 3 year long ordeal and kept his dream alive. He returned to the Pittsburgh Penguins in 1972-73, switched from right wing to left wing, and exploded for 34 goals and 75 points. He was rewarded for all his years of obstacles by winning the Bill Masterton Memorial Trophy that season. MacDonald, who also had to overcome a fear of flying with the help of a psychiatrist, proved it was no fluke in subsequent seasons. Playing along centre Syl Apps Jr. and firstly Al McDonough and then Jean Pronovost on right wing, MacDonald seasons of 43 goals (82 points), 27 goals (60 points) and 30 goals (73 points). Coach Ken Schinkel called him the Penguins best all-around player. Disaster struck MacDonald in 1976 however. MacDonald would miss the vast majority of the next two seasons thanks to a shoulder injury that eventually forced him into retirement. Lowell MacDonald played in 506 NHL regular season games. He scored 180 goals, 210 assists and 390 points. He added another 11 goals and 22 points in 30 playoff games. Lowell MacDonald is also the father of Lane MacDonald, the 1989 Hobey Baker winner with Harvard University and 1988 US Olympian. His hockey career came to a crashing halt before he even had a chance to play in the NHL thanks to concussions. Jean Pronovost was the 11th of 12 children. Older brothers Claude and Marcel also played in the National Hockey League. Claude was a goaltender who only had a cup of coffee in the NHL. But Marcel was a Hall of Fame defenseman with the Detroit Red Wings and Toronto Maple Leafs dynasties in the 1950s and 1960s. You'd think he'd be young Jean's idol. Well he was, although perhaps for a different reason. "My idol used to be Gordie Howe," he said. "Because Gordie used to play with my brother Marcel, and he brother Gordie to our home one time. And to meet that man, my eyes were as big as balloons. I idolized that guy." Jean Pronovost was no slouch either. He played 998 NHL regular season games, scoring 391 goals including 52 in 1975-76 with Pittsburgh. It was with the Penguins that Pronovost enjoyed his best seasons. He was a nice piece on one of the top lines of the 1970s along side center Syl Apps Jr. and left winger Lowell McDonald. "All three of us had our own expertise," recalled Pronovost for The Hockey News back in 2007. "Syl was the passer. I was the scorer. Lowell balanced out the line with his defensive expertise." Despite some personal success in Pittsburgh, the Penguins were going nowhere fast in the 1970s. The losing wore on Pronovost. By 1978 he requested a trade, leaving as the franchise's all time leader in goals and points. Pronovost was traded to the Atlanta Flames, hardly a contender by any means. Two years later he moved on to Washington, winding down his career with the Capitals. Pronovost quietly retired in 1981 with 391 goals, 383 assists for 774 career points in 998 NHL games. Pronovost became a long time coach with McGill University in Montreal, and also spent a few seasons coaching in the Quebec Major Junior Hockey League. He later retired and took a job driving a school bus. Ville Siren was one of those NHL defensemen that you hardly noticed. He played within his limitations, trying not to be too fancy. Ville was always a solid defenseman positionally. He learned to play hockey in his Finnish hometown of Tampere where hockey always have been popular. Ville was made a good impression with his steady play at the 1983 World Junior Championships. Scouts liked what they saw in the Finn. Hartford picked him in the 3rd round, 23rd overall in 1983. Ville stayed in Finland and Tampere for a couple of more seasons to get some more experience. He played for Ilves Tampere of the Finnish elite league and also participated in his second World junior tournament in 1984,helping Finland win the Silver medals. In 1985 he played for Finland in the World championships (seniors). Before he had even played a game in the NHL he was traded to Pittsburgh for Pat Boutette on November 16,1984. Ville's transition to North America wasn't easy. He couldn't speak any English at all except for "Beer" and a few vulgarities. It took Ville about three years in North America before he could communicate in English by himself. Once as a rookie (85-86) he tried to order breakfast on his own, leading to this memorable exchange according to his teammates.
" What would you like ?" As a rookie Ville roomed with veteran Moe Mantha who taught him all the nasty words...he learned quick. Beside the language barrier Ville found the physical play a little overwhelming at first but adapted pretty well to the North American style. Ville enjoyed 3½ steady but unspectacular seasons in Pittsburgh, scoring 56 points (11+45) in 199 games. In 1987 he played in the Canada Cup for Finland. On December 17,1988 he was traded to Minnesota where he played 1½ season (88-89 and 89-90). That was it for Ville in the NHL. He returned home to Finland for the 1990-91 season where he played for HPK Hameenlina. He continued to represent Finland internationally (Canada Cup 91, Olympics 92 and World Championships 93). In 1991-92 he played for his initial club, Ilves Tampere and then headed for Sweden where he played three seasons between 1992-95,for Lulea and Vasteras. After the 1994-95 season Ville got a lucrative offer from the Swiss club Bern and went on to play there between 1995-98. Ville was a 5th or 6th career defenseman in the NHL but could have played a lot more seasons in the league. The European style of hockey suited him better. Pat Neaton was an offensive defenseman who had a fine college career. He briefly played with the Pittsburgh Penguins. Neaton played four seasons for University of Michigan (CCHA) between 1989-93. He was a 2nd team All-Star in 1991 and a 1st team All-Star in 1993. He picked up a respectable 127 pts (38+89) in 167 games for Michigan. Pat was picked by Pittsburgh in the 9th rd.,145th overall in 1990. Pat saw his only NHL action when he played 9 games for Pittsburgh, scoring 2 points including 1 goal. The rest of the time Pat played in the IHL for Cleveland, San Diego and Orlando. Pat had a descent shot and was often used in powerplay situations. Junior hockey fans in Lethbridge were lucky to witness the hardest working line in all of hockey. In the early 1980s the Broncos were led by twins Ron and Rich Sutter and linemate Troy Loney. If there was ever a perfect unofficial triplet to play with the Sutter twins, it was Troy Loney. The native of Bow Island, Alberta played Sutter-like hockey. He was a big boy at 6'3" and 215lbs and he used his advantage effectively. He routinely patrolled his wing by keeping players honest with hard hits and strong puck pursuits. He played with great desire and it earned him a lot of respect. It also earned him a lengthy NHL career (624 games) and 2 Stanley Cup rings. Loney was physical, but he wisely played within his limitations. Though he answered the call when needed, he was not a great fighter. He also never mistook himself as a finesse player. True, the Penguins of the early 1990s could score at will, and captain Mario Lemieux could make just about any player look like a goal scorer on any given rush. But Loney's longevity in the NHL was due to his fully understanding his role and excelling at it. He scored only 87 goals in his career. Loney was a very popular player in the community, too. When the expansion Mighty Ducks of Anaheim were stocking their roster they recognized Loney's qualities both on and off the ice, and made him not only an original Duck, but the team's first captain. Loney also played briefly with the New York Islanders and New York Rangers. Loney went into the insurance sales business in retirement. Rod Buskas lasted in the NHL far longer than his skills package suggested he should have been able to. He was an average skater at best, but with time he made up for that with anticipation born from experience. He never showed up much with the puck, in terms of passing or puckhandling. He did have a heavy slapper from the point, though he rarely scored. No, Rod Buskas was best suited as a 6th defenseman, eating up some minutes while providing some physicality. He had good size and strength which he used nicely to handle players in front of his net and taking out forwards along the boards. Rod Buskas played in 556 NHL games, scoring 19 goals, 63 assists and 82 points. Buskas' other love was flying. He obtained his pilot's license while still playing. In retirement he opened his own flight training school in Nevada. You always had to respect Dan Frawley. The native of Sturgeon Falls, Ontario was an average-at-best skater. His ability with the puck was not great, whether it came to shooting or passing. His vision and anticipation were not exactly strong points either. No, but Dan Frawley did enjoy a lengthy professional career including 273 NHL games all because of desire. He was the hardest working player on every team he played. It was an infectious attitude that he brought to every game. He contributed tangibly mostly through his physical play. Though not big by any stretch of the imagination (6'0" and 170lbs) he was always willing to mix it up and cause commotion with his reckless abandon. In doing so, he often freed up ice for more talented players. In doing so Frawley could have served a nice role on a strong team. Instead he played most of his career in Pittsburgh in the 1980s. Those teams were largely a one-man show as Mario Lemieux carried that team on his back. Frawley was never properly utilized as an energy player excelling in just a few a minutes a night. Warren Young - check out the horrible airbrush job on his O-Pee-Chee rookie card - enjoyed a professional career that spanned a decade and included 236 NHL games with Minnesota, Detroit and most notably Pittsburgh. He was basically a journeyman hockey player, grinding it out on the wall and in the corners, and crashing the front of the net. There wasn't much pretty about his game, but he worked hard on every shift. Yet Young is mostly remembered for the one magical season in 1984-85 when he played along side a rookie named Mario Lemieux. Super Mario left no doubt that he was the next great hockey player. He scored 43 goals and 100 points himself, but perhaps more impressively he turned a plugger like Young - a 28 year old rookie himself - into a 40 goal scorer. Needless to say, Young was never able to live up to the 40 goal billing ever again. He left for Detroit the next season. He scored 22 times, not bad, but a far cry from what the Red Wings had hoped. Clearly the Mario factor was bigger than the Wings had estimated. Young returned to Pittsburgh after that failed season in Detroit, but he would not rekindle his magic with Mario. He scored just 8 goals in 50 games in 1986-87, as Lemieux was now playing with the likes of Dan Quinn and Craig Simpson. The following season Warren Young was all but farmed out to the minor leagues for the rest of his career. Robert Paradise, the son-in-law of notable American hockey player Bob Dill, was a rough and tumble defenseman for nearly 400 NHL games. Paradise was a natural athlete. In fact he once turned down a professional contract in the Boston Red Sox organization to complete his schooling. Besides, hockey would be his calling. He starred in Minnesota, and caught the eye of a NHL scout named Fern Flaman. Flaman was a hard hitting star with the Boston Bruins in the day, and he probably saw a little of himself in Paradise. After graduating from St. Mary's in 1966, Paradise joined the 1968 United States Olympic Team and later the 1969 National Team before turning pro with the Montreal Canadiens organization. After two years in the minors and a brief stint with the North Stars, he was drafted by the Atlanta Flames in 1972 and then went on to a six-plus years career with the Flames, Pittsburgh and Washington. The status of hockey legend is not exclusively awarded to the NHL's greatest superstar. Jock Callander is very much a legend of hockey in his own right, despite playing only 109 NHL games. But his 18 year minor league career have made him a legend particularly in Muskegon and Cleveland. Jock Callander was born on April 23, 1961 in Regina, Saskatchewan, a city he later would take by storm as a junior standout. In 1980/81 season Jock scored 67 goals along with 86 assists for a 153 points in 72 games. Jock's scoring exploits did not go unnoticed as he signed as a free agent with the St. Louis Blues on September 28, 1981. However after training camp it was determined that Jock needed more time to develop and was returned to junior for the 1981/82 season where he took his offensive dominance to a new level. He had 79 goals, 111 assists for 190 points leading the WHL in scoring. Jock made the big jump to professional hockey in 1982-83 when he joined the Salt Lake City Golden Eagles, the St. Louis Blues farm club, of the Central Hockey League. In his rookie season of 68 games he scored 20 goals, 27 assists for 47 points. The following season the St. Louis Blues moved their farm team to Montana. Jock became a member of the Montana Magic. In Jock's second pro season he continued his hard work. In 72 games he scored 27 goals, 32 assists for 59 points. The CHL folded after the 1983-84 season so Jock moved on to the I.H.L where he would play parts of 15 seasons and would become one of the best players in the history of the International Hockey League Jock joined the Muskegon Lumberjacks for the 1984-85 season and he put up some great numbers. In 82 games in 84-85 he scored 39 goals along with 68 assists for 107 points, second in team points. The next season (1985-86) Jock continued his great play and racked up another 39 goals and 72 assists for 111 points, leading the team in scoring. The Lumberjacks made the playoffs and Jock continued his torrid pace. In 14 playoff games he scored 12 goals, 11 assists for 23 points as the Lumberjacks was the Turner Cup Championship that they won that year. Jock was named as the playoffs most valuable performer. In 1986/87, Jock took his game to yet another level. He led the entire IHL in scoring (tied with Jeff Pyle actually), registering 54 goals, 82 assists for 136 points. Jock and Pyle also were named co-winners of the James Gatschene Memorial Trophy as the I.H.L. 's MVP. Jock's hard work finally paid off in terms of NHL opportunities. He signed as a free agent with the Pittsburgh Penguins July 31, 1987. During the 1987-88 season, Jock got his first chance to play in the N.H.L. The Penguins called Jock up and he split the season in Pittsburgh and Muskegon. In 41 N.H.L. games with the Penguins, he scored 11 goals with 16 assists for 27 points. Jock would split each of the next two seasons in similar fashion, playing 30 games in each season in the NHL. However Jock never was quite able to produce at the NHL level like he did in the IHL. In late 1989, Jock was back with the Lumberjacks and aided them as they went on to win their second Turner Cup Championship. For the next two seasons, 1990-91 and 1991-92, Jock spent the regular season in Muskegon and never was recalled by the Pens. It looked as though Jock's days in Pittsburgh were over but Jock just continued to focus on being the best player he could be at the IHL level and he would be prepared for the next callup. You never no if or when that callup will come. of injuries and called up replacement players from Muskegon. Jock returned to the NHL along with Mike Michayluk and Mike Needham. The trio first appeared in the Patrick Division finals against the New York Rangers. Jock, Dave Michayluk, and Mike Needham formed a solid and surprisingly effective 4th line for the Pens. The trio earned the nickname "The Muskegon Line". The Pens advanced past the Rangers and swept the Chicago Blackhawks in the Finals. Jock's long tenure of riding minor league busses finally was rewarded when he fulfilled his dream of hoisting the Stanley Cup. The N.H.L. expanded in 1992 and Jock was signed as a free agent of the expansion team Tampa Bay Lightning on July 29, 1992. Jock had hoped that his playoff performance from the prior season and his long minor league scoring exploits would mean a good chance to play in the new NHL city. However he only appeared in 8 games with the Lightning and spent most of the season with Tampa Bay's farm team - the Atlanta Knights. After one season in Tampa-Atlanta, Jock found himself back in a Lumberjacks uniform in 1993-94. However the Lumberjacks moved from Muskegon to Cleveland. Jock went on to spend the next 6 seasons with the Lumberjacks. Mike broke into the NHL after a very impressive three-year junior career with Brantford of the OHA. He collected an impressive 356 points in 174 games which led to his first round selection in the 1980 Entry Draft (9th overall) by the Pittsburgh Penguins. Bullard made his NHL debut with Pittsburgh at the end of the 1980-81 season and he played parts of seven seasons with the Penguins. Over that period, Mike recorded four 30-goal campaigns, including a career-high 51 goal season in 1983-84. He also played in the NHL All-Star Game in 1984 and he represented Canada at the 1986 World Championships. Bullard was traded to Calgary midway through the 1986-87 season in exchange for Dan Quinn. He played parts of two seasons with the Flames, including the 1987-88 season when he recorded career-highs in assists (55) and points (103) during the 1987-88 season. Disappointingly for Mike, Calgary traded the slick scoring center to St. Louis prior to the beginning of the 1988-89 season. Bullard, Craig Coxe and Tim Corkey were traded in exchange for Doug Gilmour, Mark Hunter, Michael Dark and Steve Bozek. It was unfortunate for Mike because the Flames went on to win the Stanley Cup in 1989. Bullard would be traded to Philadelphia after just 20 games in St. Louis. Bullard playing one more full season in Philly in 1989-90 before going over to Europe to play the 1990-91 season in Switzerland. His NHL absence was short lived though, as "Bully" returned to the NHL for the 1991-92 campaign with the Toronto Maple Leafs. He scored 14 goals and 28 points in what proved to be his final NHL season. In total Mike played 11 seasons in the NHL. He play in 727 regular season games, totalling 329 goals, 345 assists and 674 points. He added another 44 points in 40 playoff contests. After his 11 seasons of pro hockey in North America, Bullard continued his hockey career in Europe. He played one season in Switzerland moving to Germany for a number of seasons. The city of Pittsburgh has had it’s fair share of hockey legends – Mario Lemieux, Jaromir Jagr, Sidney Crosby. Dr. Francis “Duke” McCurry does not quite fit that list, but there was a time when the good doctor was very much a hockey legend in Pittsburgh. Toronto-born McCurry was a multi-sport star, excelling at canoeing, baseball and football. He was even the Canadian amateur welterweight boxing champion in 1916 and he was an all star at lacrosse. But it was hockey that he pursued the furthest, although that may have been partly out of convenience. McCurry was as bright in the classroom as he was spectacular on the sporting field. He moved to Pittsburgh to study dentistry, passing his spare time by playing with the local minor league team, the Yellowjackets. Somewhat inadvertently McCurry’s hockey career became more serious in 1925. The Yellowjackets were essentially disbanded in order to make room for a new team in town. The Pittsburgh Pirates would play in a league still in it’s infancy. That league was called the National Hockey League. That’s right. The NHL first came to Pittsburgh in 1925. It was a short lived venture, only 4 seasons. McCurry, a Memorial Cup champion, was already established as quite the local hockey attraction, so he joined the Pirates for four seasons. The Pirates traded McCurry to the Montreal Maroons in 1929. But McCurry had no intention of leaving Pittsburgh. He refused to report and sat out the whole hockey season. As a dentist I’m sure he found other ways to occupy his time. McCurry did return to hockey for the 1930-31 season, as the Yellowjackets were reincarnated in the IHL. Later in the 1930s McCurry returned to Toronto to establish his dental practice. He died in Toronto on November 8th, 1965. He was 65 years old. Many people celebrate Mario Lemieux as the greatest player ever to play the game of hockey. He is almost universally on everyone's "top five" list if not "top three." Based on pure talent, it is hard to argue that he is not number one. Notwithstanding his many awards and championships, and his mindbogglingly impressive statistics, perhaps the most amazing thing about Mario is he did this while battling a chronic back and hip injuries and Hodgkin's Disease. Mario was the complete package. He was a pure scorer and the ultimate playmaker fused into the body of giant. Often compared to Jean Beliveau, Lemieux was big and strong but he rarely had to rely on brute strength to fend off defenders. Instead he left them baffled with an incredible series of fakes and dekes. With a few long strides he was seemingly untouchable in effortless end to end rushes. Rarely has a sport's dominant player made the game look so easy and natural. 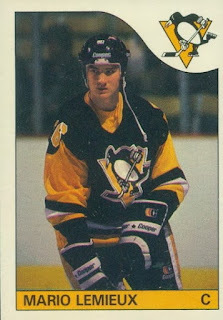 Mario Lemieux was drafted in 1984 by the Pittsburgh Penguins, first overall. Mario had just come off of an amazing Junior year, scoring 133 goals and 149 assists, giving him the highest point total in Quebec Junior hockey ever, bettering his boyhood idol Guy Lafleur's legendary goal record. The Pittsburgh Penguins were the worst team in the league. An awful product on the ice led to empty seats in the Igloo, and serious concerns if the franchise could survive much longer in the city of Pittsburgh. Mario was seen as their savior. Little did we know then that Mario would save the franchise not once but twice. In his very first game, on his very first shift, Mario put the puck behind the goalie. He would go on to win the Calder trophy that season after becoming just the third rookie to post 100 points in a season. The following two years Mario ranked among the NHL scoring leaders but it wasn't until the 1987 Canada Cup that Mario took his game to the superstar level. Playing with and learning from Wayne Gretzky, Mario had an incredible tournament, scoring a tournament record 11 goals in 9 games. His 18 points were only bettered by Gretzky's 21. Four of his goals were game winners, including the dramatic series clincher. In a scene that unthinkably rivaled the heroics of Paul Henderson in 1972, Mario took a drop pass from Gretzky and fired a shot past Soviet goalie Sergei Mylnikov at 18:34 of the third period in the final game of the tournament. "Speaking specifically of the Canada Cup in 1987," Lemieux pondered with HHOF.com, "I learned so much about how the great players work and conduct themselves. Remember, I was only 21 years old at the time. To be around guys like Wayne and Mark Messier and Paul Coffey, guys who'd already had so much success and had won Stanley Cups, was a tremendous learning experience." Mario never looked back after that tournament. Not only had he arrived in a hockey stratosphere occupied only by names like Gretzky, Bobby Orr, Gordie Howe and a very few others, but he made a serious challenge to push the stratosphere even higher. Following the tournament he had the first unbelievable season of what would become unbelievable season after unbelievable season. He wrestled away the NHL scoring championship from Gretzky, with 70 goals and 98 points for 168 points. He also won the Hart Trophy as league MVP, a trophy that was annually given to Gretzky almost by default. "The Canada Cup was very intense, but it was a great springboard for the NHL season," he admitted. "I was fortunate enough to win my first scoring title that season [with 168 points]. The learning experience and the momentum of the Canada Cup were definitely factors in that," Lemieux said. 1988-89 was Lemieux's finest offensive season. He scored 85 goals and 114 assists for 199 points. He fell just one point shy of joining Gretzky as the only player to score 200 points in a single season. Perhaps his greatest individual performance was on New Year's Eve, 1988. In that game against the New Jersey Devils, Lemieux scored five goals five different ways. He scored an even-strength goal, a power play goal, a short-handed goal, a penalty shot goal, and an empty net goal. No one had ever done this before, and no one has done it since. The first of several seasons shortened by his degenerative back problems was 1989-90. Despite this set back, he returned late in the 1990-91 season to lead the Penguins to its first Stanley Cup championship. You can bet Mario's back felt a whole lot better as he drank champagne from that Cup. In fact it helped so much the doctor's prescribed the same medicine the next year. So Mario made it two in a row in 1992. 1992-93 proved to be a damning year. He was the League's most dominant player, the crown jewel. But hockey took a back seat in Lemieux's life as Lemieux made it publicly known that he was diagnosed with Hodgkin's disease, a form of cancer. Lemieux had to take time off as he underwent radiation treatment from February through early March. Then, in one of the greatest feats in all of sports, Lemieux immediately returned to the NHL and went on late season scoring rampage to capture the Art Ross Trophy. He was also named as the MVP. Due to the many injuries and the cancer, Mario took the 1994-95 lock-out shortened season off. He returned in 1995-96, winning yet again the Art Ross and Hart Trophies. He repeated the Art Ross win in 1996-97 as well. There is little doubt that Mario is the greatest one-on-one player. He was unstoppable. "Oh Oh! It's Mario!" was a common call when he was in the open on a breakaway. He scored more often than not on those breakaways. The only way many opponents could stop "Super Mario" was to literally tackle him, and even that didn't stop him from scoring. Lemieux could almost score goals at will. Fed up with the constant physical abuse and the chronic back injuries, Lemieux opted to retire following the 1997 playoffs. But a couple of years after his retirement the Penguins were in financial ruins. Bad management had the team on the verge of bankruptcy and once again the future of NHL hockey in Pittsburgh was in serious trouble. So who came to the rescue? Mario! Mario, who stood to lose millions if the team had gone bankrupt, gathered together an ownership group and purchased the Pens, keeping them in Pittsburgh. It also marked the first time in modern history that a player became the owner of a team. Already elected to the Hockey Hall of Fame, Lemieux made even bigger waves when he announced he would come out of retirement for the 2000-01 season. On December 27, 2000, Lemieux returned to the ice as if he never missed a step. He scored one goal and added two assists in that first game back, against the Toronto Maple leafs. Lemieux continued his scoring exploits, finishing the season with 43 games played, 35 goals and 76 points. He led the Pens far into the playoffs, playing 18 games before bowing out. "I learned how much I loved this game," he said. "Sometimes you don't appreciate something fully until you're away from it." The fragility that ruined Mario's career returned in 2002. Able to play in only 24 games, Lemieux scored just 6 goals but managed 31 points. In spite of his injury woes, Lemieux was named captain of Canada's Winter Olympic entry for the 2002 Salt Lake City Games. His poise and production led Canada to Olympic Gold. Unfortunately the rigors of the Olympic schedule ended Lemieux's 2001-02 NHL season. He returned in 2002-03 and held a clear lead in points by the mid-way mark of the season. Once again injuries curtailed his games played and mobility. To make matters worse, Lemieux was forced to trade away his high-priced teammates, and any chance of winning the Art Ross Trophy, to preserve the financial stability of Pittsburgh Penguin hockey. With injuries plaguing his once-brilliant career, and with the burden of the Penguins' financial woes preying on his mind, and newly discovered heart ailment known as atrial fibrillation, Lemieux was mid-way through the 2005-06 season when he decided to retire on January 24, 2006. Mario had played 26 games, scoring 7 times and assisting on 15 more at the time of his retirement. There always has been and likely always will be constant debate as to who is better: Wayne Gretzky or Mario Lemieux. Here's my view on it. Who cares? We should just consider ourselves extremely lucky to watch perhaps the greatest and second greatest players of all time, no matter who you rank ahead of the other. If you were to break down each of their games, you would have to give Mario a huge edge in terms of god given physical talents. Mario was bigger and stronger, with a heavier shot. He was perhaps the best one-on-one player ever. He could do things that Gretzky could never dream of. The only other player who could be mentioned in the same talent level as Mario would be Bobby Orr. When Jaromir Jagr left the New York Rangers to play for Avangard Omsk in Siberia, of all places, the National Hockey League said good-bye to one of the greatest offensive players the league has ever seen. The five-time NHL scoring champ leaves the league with 646 goals, 953 assists and 1599 points in 1273 games. He leaves the league as the 9th highest scorer in NHL history, and 1st among European players all offensive categories. He holds season records for assists and points by right wingers. He leaves the league prematurely, giving up a chance to become the NHL's second-leading scorer of all-time, trailing Mark Messier by just 288 points. Such a lofty all time scoring slot is of course is incredible all by itself, especially for a kid from Kladno, Czech Republic who grew up believing he would have to defect from his family and home if he ever wanted to play in the NHL. But even more amazing when you consider he a) did not play in the 1980s like practically every other top scorer, b) he played through two labor stoppages costing him 1 and 1/2 seasons of play and c) that he has now left the NHL early. Jagr leaves the NHL with a bit of a smeared legacy. He left both Pittsburgh and Washington on bad terms, said to be only interested in money and stardom. His latter years were plagued with the enigma label, or worse, because his brilliance only shone through indifference on occasion. But why would Jagr choose the Siberian city of Omsk over New York, or any other NHL team? After all, other than far more favorable tax advantages in Russia, the money was essentially the same. Jagr has a history in Omsk, having played half a season there during the lock-out lost season back in 2005. But also Omsk offered Jagr the stability of a 2 year contract that apparently no NHL team of his liking was willing to give to him. Why was Jagr searching for only a 2 year contract? Jagr revealed that his father has requested that he return home to play in his native Kladno, Czech Republic, for the 2010-11 season. That is when Jagr's father plans to open a new arena in Kladno. "I don't think I would sign longer than two years - just because of my dad," said Jagr, a proud Czech who has always vowed to finish his career in Kladno. "He asked me to come home. He did. In two years. He wants me to come back. He's helping to build a new arena there and he wants me to be there." Even the chance to surpass Messier as the NHL's greatest scorer not named Wayne Gretzky would not keep J.J. here. Scoring 288 points in 4 seasons is far more realistic than 2, Jagr's apparent deadline for returning to Kladno. The Jaromir Jagr story begins in 1968, four years before he was born. Of course Jagr famously wore jersey number 68 to commemorate a significant conflict in his country's history -- the 1968 Soviet invasion of Czechoslovakia. Asked about why he chose a number that symbolized his country's struggle for freedom from communist repression, the flamboyant winger often turned sombre. "It's for my grandfather (a farmer and land owner, also named Jaromir)," revealed Jagr. "He died during that. I wasn't born yet but I spent a lot of time with my grandmother and she told me a lot about it. They took all the property from the rich people and my grandfather was rich. Actually, they took both my grandfathers (to jail). They let them go after the revolution but because my grandfather was so sick in jail and they didn't give him any food, he died after they let him go." Jaromir Jagr was born fours after the invasion, on February 15, 1972, in Kladno, Czechoslovakia, an ancient town of 80,000 in central Bohemia. His father - also named Jaromir - was a mine administrator who later made a fortune in the hotel business before becoming a hockey administrator in Kladno. But back when Jaromir and his sister Jitka were being raised, times were tough. After all, the family fortune was taken away and the everyday staples of life were scarce. Many Czechs, already poor, accepted this way of life, but the Jagrs harbored deep resentment against the Communist government. So much so that his heroes were Martina Navratilova, who had defected from Czechoslovakia to the U.S., and United States president Ronald Reagan, the ultimate symbol of those who stood up against the Soviet communists. Jagr even carried a picture of the president around in his wallet. Jaromir started skating around the age of three. He learned to shoot in his backyard, playing street hockey with his dad. He would practice his now famous laser of a shot by taking 500 shots a day. By age six he was on three different teams, often playing against older kids. He was definitely emerging as a hockey prodigy, but even more amazing than his skills was his drive and dedication to be the best. As a kid his stickhandling and shooting skills were far beyond average, but he was just an okay skater. When he heard that top players on the national improved their speed by doing squats, he started doing 1,000 a day. By the age of 12, Jaromir was the best young player in the country. He began his junior hockey career playing against boys five and six years older. In his first year for Kladno’s junior squad, Jaromir scored 24 goals in 34 games. In 1985, he attended the World Championships in Prague as a fan. Reportedly mesmerized by a young Canadian star named Mario Lemieux, he thus began his dream of making it to the NHL one day. Jaromir played three more seasons of junior hockey, and by the time he 16 he had simply outgrown all that junior hockey had to offer, both figuratively and literally. The tall winger towered over everyone else and outweighed the other boys by 20 or 30 pounds. With his powerful legs he who was far too fast to and with his muscular frame he was impossible to knock off the puck. He skated around defensemen like they practice pylons, just like he would do years later in the NHL. Jaromir scored 57 times in 35 games in 1987-88, earning a promotion to the Czech national team as its youngest player. Within a season, he was the country’s top star, outperforming the likes of future NHLers Bobby Holik and Robert Reichal. Then, in 1990, Jaromir and his countrymen squared off against Canada in the World Championships, facing the likes of Paul Coffey and Steve Yzerman—and beat them. Jagr has said it was this moment that he fully realized that he knew he was good enough to play in the NHL. Jagr could not have picked a better time in history to become eligible for the NHL draft. The fall of communism in Czechoslovakia was in progress in 1990. Though at draft time there was still much political uncertainty, Jagr and other young Czechs would be allowed to leave the country to purse careers in the NHL. Previous generations of hockey stars in Czechoslovakia could only hope for special permission after years of service to the national team, or risk defecting to the west, leaving their families and home behind forever. Because the political uncertainty scared many NHL teams, Jagr, the hands-down best player in a strong draft, dropped to the 5th overall selection where the Pittsburgh Penguins were more than willing to be patient with the talented superstar. And their gamble proved to be not much of a gamble at all, as political concerns were all for not. Jagr and other young hockey players were given the blessing to pursue careers in the NHL. The Penguins did their due diligence in developing Jagr. They immediately brought him to Pittsburgh and found a Czech family in the city for him to live with. They set him up with intense English tutoring a good month before his first training camp. And they would acquire long time Czech player Jiri Hrdina to give Jagr a friend and father figure. Together they were known as the Czech Mates. 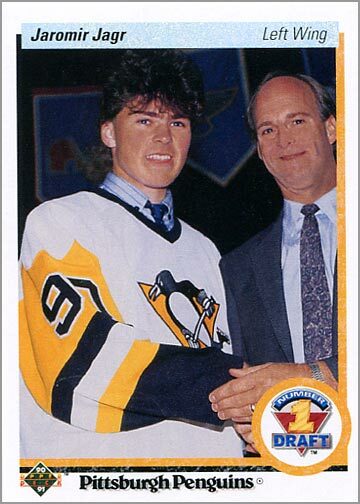 Jagr, sporting his famous long mullet, joined a Penguins team that was on the cusp of winning the Stanley Cup, if only Mario Lemieux's back injuries held up. The Penguins had assembled a ridiculous supporting cast for Lemieux—Paul Coffey, Bryan Trottier, Joe Mullen, Tom Barrasso, Ron Francis, and Larry Murphy. All but Barrasso would end up in the Hall of Fame. Now the team also boasted talented youngsters named Kevin Stevens and Mark Recchi. And of Jaromir Jagr. Jagr immediately impressed with his size and skill. The only player in the league who had the same combination of size and skill was Jagr's sometimes linemate Lemieux, leading to the popular nickname "Mario, Jr." The nickname was perfect as the two were comparables. Even more amazing was that the letters in Jaromir's name could be rearranged to spell "Mario, Jr."
In style, though, Jagr is something much different from Lemieux, as Bowman points out. "When Mario gets the puck, he's always thinking, Where can I put it?" says Bowman. "He'll pass the puck off and get himself in a better situation to score than he was in. When Jaromir gets the puck, he's always thinking, Where can I go with it? He reminds me of Maurice Richard in that way. They both played the off-wing, and both had so many moves I don't think either knew which moves they were going to do until they did them. Totally unpredictable." Interestingly, Scotty Bowman, Jagr's coach for two years, compared him to another NHL superstar from another era. "He's a different type of player than the league has seen in a long time," says Scotty Bowman , who coached the Penguins last season and is now the team's director of player development and recruitment. "He has a lot of Frank Mahovlich in him. His skating style and strength make him almost impossible to stop one-on-one. A lot of big guys play with their sticks tight to their bodies and don't use that reach to their advantage like Jaromir does." Lemieux turned out to be the perfect on-ice mentor for Jagr, if only through imitation. Both had hulking bodies but were the most graceful and artistic of players. The competitive Jagr would study Lemieux closely, determined to be just as good. Jagr would become nearly Lemieux's equal once he mastered the ability to use his big frame to his advantage. About the only thing attribute that held him back was Jagr's European-instinct to pass the puck first as opposed to Lemieux's willingness to be greedy and be the hero, scoring the big goal. Pittsburgh was always Lemieux's team, especially during the back-to-back Stanley Cup championships of 1991 and 1992. Jagr was young back in those days, but over the years Jagr would take over the ill and broken down Lemieux's status as top gun in hockey. The NHL's newest superstar was officially unleashed. With Lemieux battling the bad back and now stricken with Hodgkin's Disease, a form of cancer, Jagr assumed the lead role magnificently, winning the Art Ross Trophy with a league-best 70 points in 48 games. His 32 goals ranked second in the NHL, and he was a finalist for the Hart Trophy as MVP.The Penguins finished with 29 victories, third most in the NHL. Jaromir continued his dominance in the playoffs, netting 10 goals in 12 playoff games, but Pittsburgh bowed out in the second round. Jagr, playing with defensively conscious center Ron Francis, was willing to be the hero for the first time in his carrer. 1995-96 was a scary season for NHL goaltenders. Lemieux returned, as close to full health as he got. Now Mario and Jaromir would combine forces to produce of the most magical duos in NHL history. Mario scored 69 goals and had 92 assists to win the Art Ross Trophy for the fifth time. Jaromir scored 62 goals and dished out 87 assists to finish second to his teammate in the scoring race with 149 points. With his great year, Jaromir established himself as one of the great right wings of all-time. No one at the position had scored more points in a season or tallied more assists. He led the league with 403 shots on goal, further proof his mindset had changed to become the best player. But perhaps the most remarkable feat of Jagr's amazing season was that other than on the power play, he did not often play on Lemieux's wing. Instead he was the shining jewel on Line 1a with Francis and fellow Czech Petr Nedved. 1996-97 was a frastrating season as Jagr missed 19 games with a groin injury. Even more daunting for Penguins fans, Lemieux announced his retirement, putting more pressure on Jagr to be the man, even though opponents could now throw all defensive strategies against just the one line. Despite the nagging groin injury, Jagr responded positively again, scoring 35 goals and a league high 67 assists, earning him his second Art Ross Trophy and the first of four consecutive NHL scoring titles. He was also a finalist for the Hart trophy as MVP, losing to Buffalo's Dominik Hasek. But 1998 was known for Jagr and Hasek's combining of forces to lead their native Czech Republic to the gold medal in the first ever winter Olympic games where all of the NHL's top players were allowed to participate. Hasek led the way in net while Jagr scored 1 goal and 4 assists. The gold medal victory was made even sweeter for the Czechs as they defeated the Russians. Before returning to their various NHL teams, the Czech team returned to Prague and celebrated with over 100,000 waiting fans at Wenceslas Square. Upon return to the NHL, Jagr continued to dominate offensively, despite a poor supporting cast, the dead puck era, and a coach, Kevin Constantine, that preached tight defense and dump and chase hockey, something Jagr never warmed to either publicly or privately. Despite a lucrative 6 year contract, rumblings of Jagr's unhappiness were appearing for the first time. Yet in 1998-99 he turned in one of the best seasons in recent memory, skating off with the Hart Trophy as league MVP, his only such title though he was finalist 5 other times in his career.. Jaromir won the scoring title by 20 points, with 44 goals and 83 assists. He also captured the Lester B Pearson Award, the MVP as chosen by his fellow players. Jaromir repeated as NHL scoring champ, despite missing a quarter of the season to nagging leg and back injuries. He tallied 42 goals and 54 assists for 96 points in a league plagued by the neutral zone traps and oversized goalie equipment. Had the Penguins provided him with a couple of top-flight linemates, and had he remained healthy, Jaromir could have legitimately outscored every other NHL player by 30 or 40 points. He was now that good. Jaromir won his fourth straight scoring title in 2000-01, with 52 goals and a league-best 69 assists for 121 points. He started strong and finished even stronger, earning NHL Player of the Month honors in both November and March. He scored his 400th goal and 1,000th point during the campaign, and also played in his 800th NHL game. Although the Penguins finished third in the division, they reached the conference finals for the first time since 1996, falling to the Devils in their quest for a berth in the Stanley Cup Finals. Ultimately that was as much playoff success Jagr would ever achieve in the post-Lemieux era, forever seperating Lemieux from Jagr amongst the all time greats. Jagr would leave Pittsburgh under less than great terms. Surprisingly, he struggled under and clashing with Ivan Hlinka, the first Czech coach in NHL history. Some Pens fans even turned on Jagr, labelling him as disinterested. Jagr wanted out, and was traded to Washington in 2001 for essentially nothing. The Capitals would sign Jagr to a whopping 7 year, $77M deal. But Jagr never got untracked in Washington, and the numbers of cynics only grew larger. He was brought in as the superstar who was supposed to return a strong Caps to the Stanley Cup finals. Under the great pressure of the contract and the expectations, Jagr stuggled and ultimately floundered. His stay in Washington was nothing short of disastrous. After 2 and 1/2 seasons, the Capitals moved Jagr to the New York Rangers, but they had to agree to pay half of his salary to start over. Jagr was able to find his game in New York, turning in an impressive 54 goal, 123 point season in 2005-06, earning another Pearson trophy. More importantly, he was able to, unlike so many other faded stars who found their way to Broadway late in their careers, re-establish himself as one of the game's greatest players, shaking off many of the labels of a greedy, disengaged enigma that hounded him over the previous few years. The kid from Kladno found the love of the game again in New York, and his smile. The NHL found their love for J.J. again, too. In a New York minute. Though he leaves under strange circumstances, NHL fans over the past 18 years have mostly loved him too. He truly is one of the NHL's greatest players in league history. In 1998 a panel of experts organized by The Hockey News included Jaromir Jagr at #37 on the definitive list of the greatest players of all time. That was 11 years ago, just as his career was kicking into high gear. Now, with several more significant seasons and many longevity feats to add to his resume, he would surely rank in the top 20. Dennis Owchar played 6 seasons in the NHL during the 1970s. He was a physical defenceman who loved the open ice hits. "I played defense and probably the one thing that stood out in my game was the body-checking, playing the man. I used to catch a lot of guys coming across the middle of the ice with their head down or just as they were getting their head up and make them regret it, if you will." said Owchar in an interview with NHLPA.com. Dennis played his junior hockey with the St. Catharines Black Hawks and Toronto Marlboros and caught the eyes of the Pittsburgh Penguins. They selected him 55th overall in the 1973 Amateur Draft. After being drafted, Owchar immediately turned professional with the Hershey Bears of the American Hockey League, a Penguins affiliate team that year. He recorded 33 points in 74 games with the Bears in his first pro season and after beginning the 1974-75 campaign with Hershey he made the jump to the parent club early that season. It started out as a injury replacement stint but Owchar played well and the Pens kept him for the rest of the season. In that first NHL season he recorded 17 points in 46 games. Owchar spent three and a half years with the Penguins organization before he was traded to the Colorado Rockies during the 1977-78 season, where he recorded career-highs in all offensive categories with 10 goals, 31 assists and 41 points in 82 games between the two clubs. His most famous moment in Colorado was an unfortunate one. Tiger Williams of the Toronto Maple Leafs attacked him with his stick. Williams was charged with assault, although he was acquitted of any wrong doing. Dennis played the 1978-79 season with the Rockies and part of the 1979-80 season with Colorado before playing his final full season of professional hockey with the New Haven Nighthawks of the American Hockey League. Dennis had a couple of serious injuries and decided to pack it in. Owchar retired from pro hockey in 1981. Over his six years in the NHL, Owchar had 30 goals, 85 assists, 115 points and 200 penalty minutes in 288 regular season games. Following the NHL Dennis returned to school and eventually ended up in the computer industry as a successful salesman and executive. Remember that old Life cereal commercial with Mikey? Due to an uncanny resemblance, Mikey was Ken Wregget's nickname. Ken Wregget was a goalie with three distinct NHL chapters in his story. Wregget, who was born in the goaltending factory of Brandon, Manitoba and was a graduate of the Lethbridge Hurricanes junior program, broke into the NHL with the Toronto Maple Leafs in the mid 1980s. Those Leafs teams were particularly, ummm, well awful, really. But there were some high hopes mixed with inconsistency when Wregget and fellow young netminder Allan Bester arrived on the scene. On some nights they were spectacular, on other nights they were hung out to dry. Perhaps Wregget's very first NHL game sums up his 6 years with the Leafs perfectly. In a game against Hartford in the 1983-84 season, Wregget made 48 saves to get the win! Spectacular right? Not bad at all, but he did let in 6 goals. Fortunately on this night Toronto was able to score 8, but more often than not the Leafs were not able to support either Wregget or Bester with enough goal support. Bester eventually won the goalie battle in Toronto as Wregget was trade to Philadelphia for two first round picks that the Leafs used to select Rob Pearson and Steve Bancroft. Neither of those two prospects ever flourished, while Wregget provided steady netminding for the Flyers for much of the next three seasons. Wregget was part of a blockbuster trade in February 1992, as he, Rick Tocchet and Kjell Samuelsson went to Pittsburgh in exchange for Mark Recchi, Brian Benning and a first round draft pick. Wregget would find his best success in Pittsburgh, backing up but often pushing starting goaltender Tom Barrasso. Wregget enjoyed his only Stanley Cup championship in 1992. By the lockout shortened season in 1995 he emerged as the top goalie, leading the league with 25 wins. Barrasso would eventually wrestle his starter title back and by 1998 Wregget was on the way out of Pittsburgh. He briefly played in Calgary and Detroit, before hanging up the pads in 2001. In 575 NHL contests Ken Wregget posted a record of 225-248-53 with 9 shutouts, a career 3.63 GAA and .885 save percentage. Great numbers? No, not even for his time period. But he had a reputation as a solid goalie, particularly in the back up role. Grant Jennings was a large, aggressive blueliner who lacked mobility to make him much more than an average NHL defenseman. But he was able to mature into a capable role player who twice would sip sweet victory from the Stanley Cup. The Saskatchewan native was never drafted by an NHL team. Instead he signed a minor league contract in the Washington Capitals organization. He spent three years developing in the American Hockey League. By 1988 Grant made his NHL debut, and in the playoffs nonetheless. Grant was moved in the off season to Hartford. He and tough right winger Ed Kastelic were traded to Hartford in exchange for Neil Sheehy and Mike Millar. It was a great move for Grant as he became an NHL regular. Jennings played a quiet role in Hartford for two and a half seasons. He relied on strong positional play and was at his best when he was using his size to his fullest advantage. Part way through the 1990-91 season Jennings was involved in one of the most famous trades in hockey history. Grant is an often forgotten about throw-in in the Ron Francis/Ulf Samuelsson trade to Pittsburgh. The Whalers got John Cullen, Jeff Parker and Zarley Zalapski in return, but the trade was considered to be the final piece of the Penguins championship puzzle. Francis and Samuelsson played big roles in the Pens back to back championships in 1991 and 1992. Grant played a quiet role on those championships too. He had to battle the likes of Gordie Roberts, Paul Stanton and Peter Taglianetti for the 5th, 6th and 7th defensemen positions and the accompanying playing time. Jennings was rotated in and out of the lineup during the playoffs as well as the regular season. He appeared in 22 of the Pens 45 playoff games in the two years that they won the Cup. Jennings played in parts of 5 seasons with the Pens before being moved to Toronto late in the 1995 season. Grant was about to become an unrestricted free agent, and the Penguins wanted to get something in return for him before he could get away with nothing in return at all. Jennings played 10 games with the Leafs and then tested the free agent market. He eventually settled on a contract with the Buffalo Sabres during training camp 1995. However injuries plagued Grant for the remainder of his career. He only got into 6 games with the Sabres before he disappeared to battle injury problems in the minor leagues until 1998 when he retired. In 389 NHL games, Grant scored 14 times and added 43 helpers for 57 points. He accumulated 804 penalty minutes in that time as well. He appeared in 54 playoff games, scoring twice and picking up 3 points and 68 PIM, plus 2 Stanley Cup rings. Joe Noris was born in Denver, Colorado but learned to play competitive hockey in Canada. As a youngster he used to hang around the Denver University hockey team. Denver's coach Murray Armstrong recommended Joe to start out by trying junior "B" hockey in Canada. Joe played his junior hockey with the Kitchener Rangers and the Toronto Marlboro's. In Kitchener Joe was a center, but the Marlboro's were so stacked with forwards that his coach Frank Bonello decided to switch Joe to defence. When he was claimed by Pittsburgh during the 1971 amateur draft (32nd overall), it was as a defenseman. his first pro season, especially because his experience on defence was limited." Kelly said. Joe's NHL career was pretty brief. Beside the 35 games for the Penguins he also played two games with St.Louis (72-73) and 18 games with Buffalo (73-74). Most of the time was spent in the minors and not until WHA's San Diego Mariners signed him in August 1975 did he get to taste major league hockey again. Joe had a very good first season in the WHA, scoring 68 points for San Diego. The night after the Mariners were eliminated from the playoffs Joe crashed his car and recieved cuts in his face that required over 100 stitches, other than that he was alright and his fine play earned him a spot on the American 1976 Canada Cup team. Joe came better prepared for the 1976-77 season than ever. This of course because of the Canada Cup tournament. Joe scored 92 points for San Diego and finished 12th overall in league scoring. At this point Joe had been a center for a couple of years, his initial position. The San Diego franchise folded and he was picked up by the Birmingham Bulls in June 1977. He wasn't able to repeat the successful years that he had in San Diego. Joe decided to go back to San Diego and play there for the San Diego Hawks in the PHL (Pacific Hockey League) for the 1978-79 season. Joe teared up the PHL, scoring a league high 77 assists and 104 pts in only 58 games. Joe then got a lucrative offer from the Austrian team, ATSE Graz, where he played briefly during the 1979-80 season before retiring. "Broadway Joe" finished his career with a total of 55 NHL games (7 points) and 198 WHA games (188 points), plus 18 WHA playoff games (9 points). When I heard the Kamloops Blazers had signed Matthew Needham, I immediately thought to myself "I wonder if that kid is any relation to former NHLer Mike Needham." The answer is yes. Matthew is Mike's son. He has some big shoes to fill in Kamloops let alone in the NHL. Mike Needham starred with the Blazers from 1987 through 1990. After being drafted by the Pittsburgh Penguins 126th overall in 1989, Mike exploded for a monster season in Kamloops, scoring 59 goals and 125 points in just 60 games. The Blazers made it all the way to the Memorial Cup tournament that spring. He also had 7 points in 7 games at the World Junior Championships, winning gold. Mike turned pro the following season, and soon enough he was tearing up the IHL. Described as a good skater with excellent work habits, the only thing standing in Mike's way of achieving his NHL dreams was an incredibly well stocked right wing in Pittsburgh. The Penguins were in their Stanley Cup prime in the early 1990s, boasting Jaromir Jagr, Rick Tocchet, Joe Mullen and later Tomas Sandstrom all on their right wing. Needham and other Penguins prospects had no chance of cracking the line up. Mike did get into 5 playoff games in 1992, allowing him to get his name on the Penguins 2nd Stanley Cup championship. The following year Needham played a bit role on the Pens 3rd and 4th lines, scoring just 8 goals in 56 games. A serious back injury hampered him all year. Surgery was required to repair the herniated disk It kept him to just 25 games (and one lonely goal) in the 1993-94 season. The Pens traded Needham away to Dallas where it was hoped he could put his injuries behind him and fulfill his promise. He would just play 5 games the Stars. After parts of two more injury plagued seasons in the minors, Mike Needham hung up his skates for good. Mike Needham played in 86 NHL games, scoring 9 goals and 5 assists. He added 2 more goals in 14 playoff games, earning a Stanley Cup ring in 1992. Rick Kessell got his NHL career off to a fantastic start. He scored on his very first shift, giving the Pittsburgh Penguins a 1-0 lead just 2:19 into a March 21st, 1970 game against Chicago. Unfortunately Kessell would only score 3 more goals in 134 more NHL games over parts of 5 NHL seasons, 4 with the Penguins and 1 with the Golden Seals of California infamy. I guess it probably didn't help that he missed training camp in his second NHL season due to an off-season water skiing mishap that broke his ankle. Kessell was a junior stand out and was drafted two spots ahead of the great Bobby Clarke. But at the NHL level Kessell quickly became a 4th line player who killed penalties. Walt McKechnie, Kessell's teammate in California, said "Kess was another guy with good skills but with us young guys he was easily distracted. He was a real free spirit. In 135 NHL games Rick Kessell scored 4 goals and 28 points. This is Nick Harbaruk, a hard working forward who played over 500 big league games in the 1970s. Harbaruk was a hard-hitting, defensive winger, specializing on the penalty kill. He often energized his team with his relentless checking. Interestingly, Harbaruk was born in Drohiczyn, Poland on August 16th, 1943, during World War II. By 1948 his family had moved Toronto to start a new life. Nick quickly picked up the Canadian game of hockey and turned into a star youth player. Soon enough he was a star with the Toronto Marlies junior team. The Toronto Maple Leafs owned his rights but placed him in Tulsa, Oklahoma for 5 seasons. The Leafs actually tried to upgrade him from the CPHL to their AHL farm team, but Harbaruk refused to leave. He met his wife there and was earning a degree in economics from the University of Tulsa. That stand probably cost Harbaruk a chance to ever play with the Leafs. They would have buried him in the minors forever, but NHL expansion in 1967 opened up jobs for many such players. The Pittsburgh Penguins snapped him up. Harbaruk played four solid seasons in Pittsburgh, and another in St. Louis, before jumping to bigger money with Indianapolis of the WHA. He retired in 1977. Harbaruk returned to Toronto and started coaching at Seneca College. In 7 seasons Harbaruk found great success, winning 3 Ontario college championships. His legacy there was tainted by an assault charge when a fan behind the bench was struck with a stick. The charge was later dropped. In 1986 Harbaruk left hockey behind. He and his brother took over their father's sod supply business for local landscapers. Nick Harbaruk passed away in the early morning hours of March 11th, 2011. Dwight Mathiasen was one of many highly regarded prospects who never caught on in the NHL. He played in the BCJHL (British Columbia Junior Hockey League) for a couple of seasons. In his last BCJHL season in 1982-83, he scored 123 points (50+73) in 48 games for the Abbotsford Pilots. He then went on to play for the University of Denver where he had a stellar career between 1983-86. Dwight scored 198 points in 123 games for the "Pioneers" which was the second highest point total in school history at that time. In his junior year (1985-86) Dwight exploded for 89 points in 48 games, including a school record 28 game scoring streak. He was also named to the 2nd WCHA All-Star team. Dwight was never drafted but was grabbed by Pittsburgh in the college free-agent market. At first Dwight indicated that he wanted to play in his hometown Vancouver (where he grew up). Somehow he rejected a last minute $1.4 million offer from the Vancouver Canucks. Instead Dwight signed a four year $ 1.2 million contract, which included a $250,000 signing bonus with Pittsburgh. His yearly salary put him above Detroit's record free agent signings of Ray Staszak and Adam Oates the year before. At the time of the signing Dwight said that he was attracted by the Pittsburgh organization and the possibility to play on Mario Lemieux's right side. Dwight was available to play for the Penguins in their final four regular season games in 85-86, but wasn't eligible for the playoffs because he wasn't with the team as of March 11 (he signed on March 31), the date NHL rosters were frozen. Dwight made his NHL debut the day after he had signed, on April 1,1986 at Washington. Five days later (April 6) he scored his first NHL goal & point at Madison Square Garden against the NY Rangers. A lot was expected from Dwight at the start of the 1986-87 season, but he had a so-so camp and was sent down to Penguins farm team in Baltimore (AHL). He played in Baltimore for most of the season and finished with 45 points in 61 games and only played in 6 games for Pittsburgh. In 1987-88 Dwight played 23 games for Pittsburgh and didn't score a goal (he had 6 assists). In the IHL for Muskegon he had 61 points in 46 games. After that 1987-88 season Dwight retired only 25-years old. He never fullfilled the expectations although he certainly had all the tools to become a solid second or third line winger. What Dwight will be remembered for is that he was among the first three rookie free-agents to sign a $ 1 million plus contract.